• During the cold weather, cats often take shelter under the hood of cars. A warm engine is a comfortable area for a cat to rest. When the car is started, the cat risks severe injuries from the fan belt or blades. Before starting a car, knock on the hood or raise it in order to conduct a safety check. 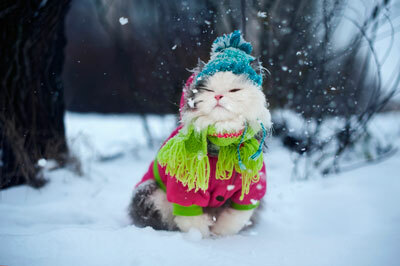 • Paws should be checked regularly during the winter months. Snow and ice should be removed from the fur located between the toes. Damp paws should be thoroughly dried. Moisture that accumulates between the toes can cause sores. Deicing chemicals and salt are common irritants. If these products are commonly used, animals paws should be bathed regularly. • Antifreeze is extremely toxic if ingested by animals. The sweet taste is often appealing to cats and dogs. Antifreeze that is spilled should be cleaned up immediately. • Occasionally an animal is accidently left outdoors for an extended period of time. As a result, frostbite may occur. The most common areas for frostbite are the tips of the ears, paw pads, and the tip of the tail. The frostbite area should be bathed in warm water (not hot) then the animal should be taken to a veterinary hospital.